My good friend and fellow author, Katharine Grubb, once offered a blog post about creating interesting characters. What stood out to me as I read it was her advice to give your main characters defining quirks. She also suggested your characters each have a hobby. The better you know your characters, the easier it is to clearly see those quirks each uses in various situations. Hobbies they are likely to enjoy emerge as well. 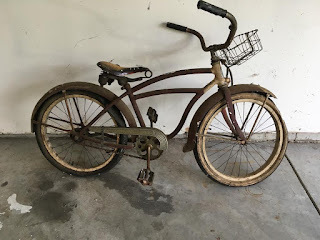 A character in my latest novel restores vintage Schwinn bikes as his hobby. A few days ago, my mother and I were talking about identifying quirks and hobbies of a few well-known television characters. It started over lunch. I made us hotdogs with all the trimmings. We rarely eat such heart clogging food anymore, so having a picnic of sorts on the deck with hotdogs was a treat for both of us. We started talking about Matlock and his proclivity to inhale a hotdog at every turn. Do you remember his hobby? Music. You’ll often see him playing a guitar and singing. What else defines him? How about the gray suit? Since that conversation I find myself watching television and reading books with a keen interest in the quirks and hobbies of characters. Hawkeye Pierce sniffs his food. Jethro Gibbs on NCIS has an addiction to coffee and spends his spare time building a boat in his basement. One of my favorite quirks comes from an old movie called She’s All That. Laney Boggs is a teen geek being transformed into a popular girl by the coolest guy in high school. But Laney’s father is one of my favorite characters. Mr. Boggs loves to watch Jeopardy every evening. His quirk? He answers every question confidently…and wrong, making him both memorable and lovable. What quirks and hobbies do your characters have? Do they indulge in chocolate or have an affinity for pie? Maybe your character collects vintage postcards or teapots. Does your character like to fish or whittle? If you can’t answer this question, then maybe you need to spend a little time getting to know your characters better. What are some of the favorite quirks or hobbies of television or movie characters? Respond below…this could be fun. “Excuse me?” My husband asked. Writing a believable setting that you have only passing or no personal familiarity with can be a daunting task for any writer. Little did I know that two years following our trip to Scotland it would become the setting for my debut novel, Land of My Dreams. Had I known, I would have looked at things very differently. Once you decide to write, every event, interesting building, unusual accent, even people at the grocery store become potential material for creating setting and characters. The villainess in my current WIP was a woman in the small town grocery store where I shop. 1) Travel, whether you’re writing historical or contemporary. If your story takes place in your own area, look at it as a first-time tourist. I dragged my husband to familiar places near our home time and again, listening to the sounds and inhaling the distinctive aromas of New Mexico. I thought about what I missed the most when we lived out of state for a while. 2) One of my most powerful tools is a screensaver of over 400 images. Pictures from the internet are great as long as they’re for personal use only. I overlooked the spot where Kieran’s sheep farm is located in Land of My Dreams for only 15 minutes, but there are guesthouses on Loch Garry with great photos of the surrounding area on their websites. A friend who raises sheep was invaluable. 4) Watch movies, read tour books, and check weather reports. During a recent documentary, I realized there is a map of Scotland in my head. 5) Study customs, holidays, colloquialisms, schools, churches, and local history—even for contemporary fiction, you never know when it might add some interest. 6) Research restaurants in the area and read the menus online. Buy a cookbook and try some traditional foods. How does it smell and taste? What ingredients, both familiar and unfamiliar does it contain? I ate haggis, sheep’s offal mixed with spices and oatmeal, boiled in a sheep’s stomach. 7) What political issues impact their lives? The recent referendum on Scottish Independence is a good example. 8) What would they do for fun? The Highland Games in New Mexico gave a little flavor, but nothing compared to our day in Ballater, Scotland. A dapper, elderly couple, wearing tartan and eating ice cream cones under an umbrella while exclaiming, “It’s a lovely day”, still makes us smile and found their way into my book. “Hill-walking” is a national pastime. 9) Get advice from people familiar with your setting. I found an editor who lived in Scotland and still has friends there. 10) Go for the small details. Little things bring your story world to life. I studied online lists of slang, colloquialisms, and Scots-Gaelic to make the dialogue ring true. A friend who read an early version of my book suggested a man would never use the word “lovely.” Have you watched any television programs from the UK lately? My current area of research is North Carolina to New Mexico from the 1770’s to 1920’s. Pinterest provides an awesome array of maps, antique furniture, old houses, period clothing, even links to articles and videos. For someone who took on a foreign country for their first book, it doesn’t seem like much of a stretch. Be curious. Be creative. Be cautious. Become a contemporary of your characters. It can change your story from still to sparkling. Land of My Dreams is now 3 years old! 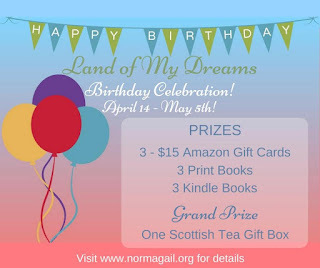 I have a contest running on my blog with great giveaways! 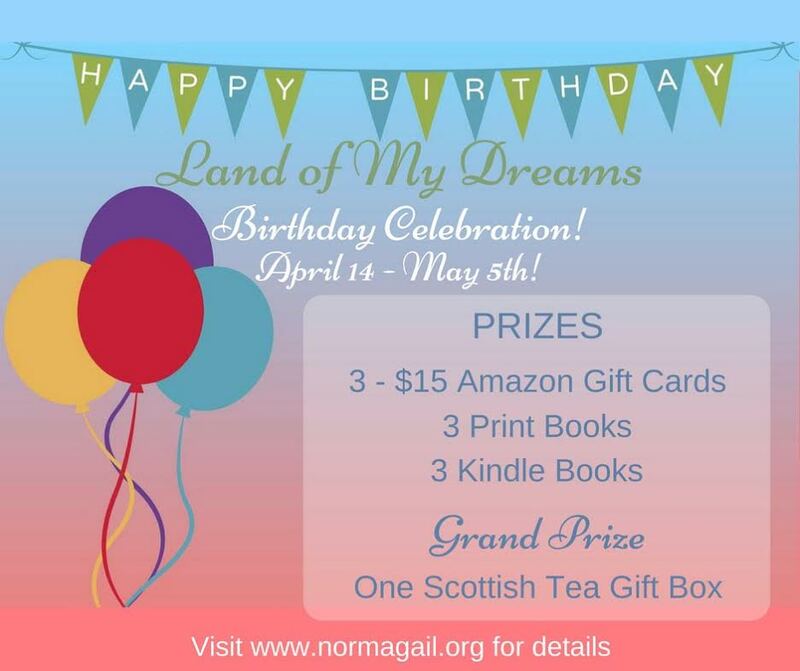 Stop by at http://www.normagail.org/land-of-my-dreams-celebration/ to enter! 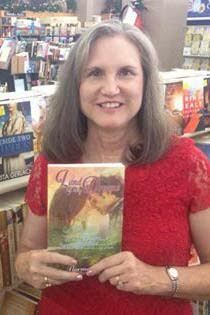 Alone and betrayed, American professor, Bonny Bryant longs for a haven of peace. She accepts a position at a small Christian college in Fort William, Scotland, craving escape from her painful past. The passionate love, which develops when she meets fellow professor and sheep farmer, Kieran MacDonell, is something she never anticipated. 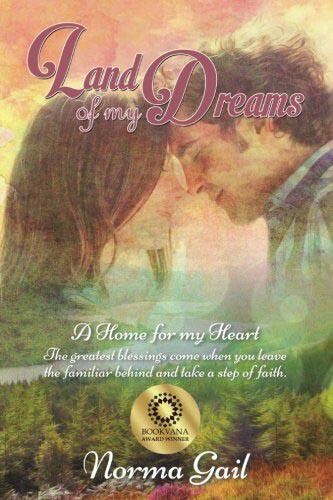 Norma Gail is the author of the contemporary Christian romance, Land of My Dreams, winner of the 2016 Bookvana Religious Fiction Award. A women’s Bible study leader for over 21 years, her devotionals and poetry have appeared at ChristianDevotions.us, the Stitches Thru Time blog, and in “The Secret Place.” She is a member of American Christian Fiction Writers and Romance Writers of America. Norma is a former RN who lives in the mountains of New Mexico with her husband of 40 years. They have two adult children. Hang in to the end and enter to win a free book especially for writers! Replace caulking around the window? Paint the woodwork in the bathroom? Well, you get the idea. The list goes on and on. Some of the jobs are big and some are small. All are going to cost money. So the do-it-yourselfer in me kicked in. 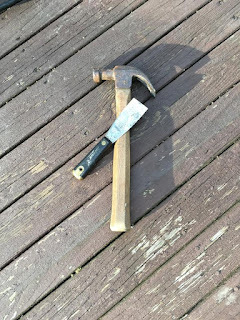 I figured if my husband could do these things, so could I. I’ll admit I’ve had some family members and friends step in to help, but I’ve also learned how to put down a smooth bead of caulking by watching YouTube. It turns out you can find nearly anything on YouTube. Some of it is good. Some of it is helpful. And yes, there are some videos out there that are neither good nor helpful. 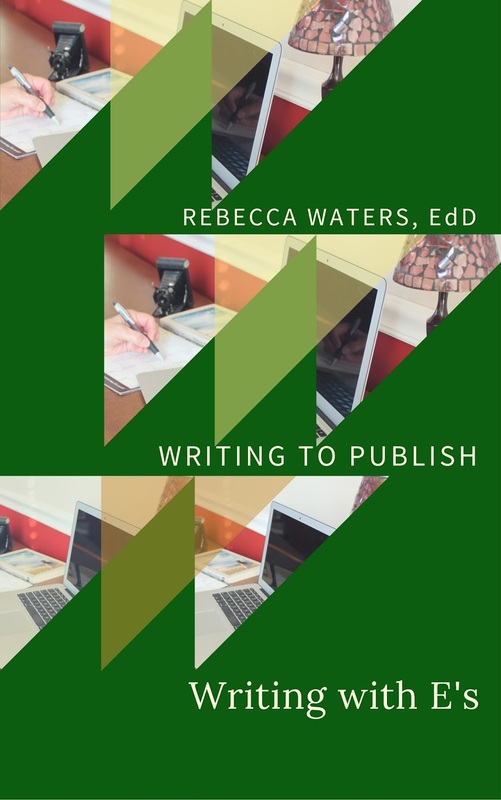 You can find YouTube how-to videos on drafting a novel, editing, revising, indie publishing, traditional publishing, understanding a contract, and well, nearly every topic you may question in the writing and publishing process. Beware: Sifting through the potential videos takes time. You will find a few prolific YouTube personalities who publish strong and helpful series. You may find an interview with one of your favorite authors or with an agent giving you great tips on talking to an agent. The point is this: Every writer needs to pursue professional development. Writers need to study their craft on a regular basis. It must be a part of their business plan if they wish to succeed. I also found two YouTube offerings on the elevator pitch I want to share. The first is a guide to boil down your finished manuscript into one sentence and the second is an intriguing short video offering you six creative ideas to pitch your book. NOW FOR YOUR HOMEWORK: See if you can find a YouTube offering that is helpful for other writers. Paste the link in the comment section below. #WritersHelpingWriters! Have fun! And if I have at least five people finding helpful videos to share, I’ll throw the names in a hat and give away three of my books from the Writing to Publish Series: Designing a Business Plan for Your Writing, Marketing You and Your Writing 101, or Writing with E’s. Note: This post first appeared on Hannah Conway's blog as part of the anniversary celebration for Breathing on Her Own. Publishing that first novel is akin to raising your firstborn child. You do your best, make a few mistakes, and learn along the way. Now that Breathing on Her Own is a three-year-old, I’m prepared to offer other fledgling parents of books my sage advice. I'm including links to three short handbooks you will find helpful in setting your course to birth your own "Bookchild." First time parents want to do this whole baby thing right. Moms exercise and eat healthy. Dads dutifully paint the nursery. The couple reads everything they can about raising children and they spend long hours discussing the child’s name. In the same way, writers seeking to be authors need to exercise their writing muscle in order to draft that sweet manuscript. They must purposefully study the craft of writing and nuances of publishing. Writers need to identify their strengths and weaknesses and create a plan to improve as a writer. Choosing the title will emerge as the story unfolds. When I embarked on crafting that first novel, I created a business plan for my writing. I budgeted my time to study writing and publishing and engaged daily in writing exercises. You wrote it. You love it. I get it. However, nobody births a perfect “bookchild.” Even the best of the best authors must revise and edit their work on a constant basis. I worked hard on that first novel to write a compelling story. I was sure I nailed it. When my publisher introduced me to my editor I waited for her to rave about the book. Fortunately, she knew her job was to polish my work not to caress my ego. Working with a professional editor may be painful or even costly. Think of it as putting braces on your child to correct the overbite. Healthy straight teeth improve speech quality, digestion, and physical appearance. A professional edit will allow your voice to be heard. It will give your manuscript the look and feel of a successful book. Once I decided to become an author I attended a writing conference. I hadn’t finished the first draft of Breathing on Her Own but was very close to the end. I pitched the book to agents and acquisition editors for publishing houses. I practiced what is called an elevator pitch. The first two agents interrupted me about halfway through my pitch. The next one and a couple of the publishers offered a kind word but a firm no. My last appointment was with Eddie Jones of Lighthouse Publishing of the Carolinas. He listened. He read the chapters I sent him. Two months later I had a contract. Not everyone will choose your book, but it only takes one.